I have a feeling you’re reading this blog post because you’ve started to realize that playing it safe is risky. That is, you won’t achieve what you really want in life if you stay on the standard path. You are not content being a cog in someone else’s design. You do not like chugging away—day after day—just to be average. You are pouring the majority of your time and energy into someone else’s company…someone else’s dream. You are doing what most other people do, and you’ve become a blur. Your job defines you, but it’s time to turn the tables. It’s time to design your new life and create the money-making machines to support it. It’s time for you to control your income—and stop letting it control you. But what will it take to get you to actually make this happen? Why haven’t you done it already? Most exceptional people I know have experienced a traumatic, life-altering event. Tough moments seem to force a new perspective in a life-altering way. Do we need to be knocked down to really stand up? Maybe it’s time for me to make some changes in my life. It’s as though we all begin our adult lives by walking down a road, heads held high, our vision clear, our steps confident and controlled. We know where we’re going. Our teachers, family members, and others have all pointed us down that the road. The standard road. Over time, our gaze drops, and we stare at our feet—so much so that we miss what’s around us. Heads drooped, we progress in assembly-line fashion. The world and our role in it narrows. Our experiences contract and become less memorable. We’re a cog…working day-to-day for someone else. Our life is a blur. But sometimes, something violent and unexpected happens. Without warning, one of us is struck. Something crashes across the road and takes a poor soul with it. Those around recoil in horror and droop closer to the security of the road. But what about the one who was struck? After the moment of shock, they look up and around. They see the world around, the world they had stopped seeing. They see the sky. Their head is ringing and their body is battered, yet their excitement and happiness is palpable. The road no longer matters; this is the first day of the rest of their life. My moment occurred on an otherwise peaceful, typical, narrow-world day. I was sitting in my home office, working through email, and droning through a conference call. I’d grown accustomed to the daily grind of my six-figure job. A great cup of home-brewed coffee was never far away, and I didn’t have to worry about wearing a tie…or even shoes. My dog generally lay at my feet, happy to keep me company all day. To anyone watching, my day might have seemed pretty envious. But that day decided to take a left turn and jolt me out of the grind. I was about to get knocked down. Flu-like symptoms crept on quickly. I began losing concentration and feeling nauseous. I excused myself from the conference call and lay down on the floor. While I was fine mere moments earlier, I suddenly didn’t have the power to get up and leave the room. The whole experience struck me as entirely unreal. I had never felt so horribly sick so quickly. I had no reason to suspect any health issues. I was young and fit. I worked out regularly and ate well. But as my symptoms progressed, my ability to reflect on the situation faded. Everything intensified rapidly and showed no signs of slowing down. The room was now spinning violently. The room was now spinning violently. I was pinned to the floor. I don’t exactly remember what happened next, but I must have managed to call my wife. The next thing I remember is being upstairs in the bedroom. But my problems continued to escalate. The best way I can describe the feeling is to say it’s probably how you’d feel if you downed 20 shots of tequila in under ten minutes. At this point, I only have a handful of memories in still-frame fashion. They start with my wife somehow dragging me into the car and rushing me to a nearby urgent-care center. I remember dropping out of the car as she opened the door. She feared I was having a heart attack. While I was rolled in on a stretcher, the doctors assessed me but could not determine the issue and could not stop the symptoms. I needed to be transported. Once I arrived at a full hospital, I received medication that actually seemed to help. And then with a great sigh of relief, I simply shut down. When I woke—innumerable hours later—the ordeal was over. But it’s impact wasn’t. The ordeal was over. But it’s impact wasn’t. Whatever happened, it was enough to jar my consciousness loose. I had been knocked off the road, and I felt as though I was seeing the world for the first time. I evaluated everything about my life. I thought about my family, my ambitions, and what was important to me. I saw my future. I knew what would happen if I stayed on the road. See, I had already achieved what the world considers standard goals at a young age. I was working for a big company, earning good money, and by all external appearances, had made it. But this event made me question everything. Did I really want to end up like the lifers at my company—at any company? What was I missing out on? What would I be missing out on? Life felt big and full. But work dominated it…work I was doing for someone else…work that was forgettable and inconsequential. At the end, it wasn’t what mattered to me, so why was I spending most of my waking hours, most of my thoughts, and most of my energy on it? I was on the path everyone told me to walk. And I wasn’t just walking on it…I was running! Wherever that path was going, I had been determined to get there quickly. But everyone was wrong about the path. And I was wrong too. I was on the wrong path. My event was minor. I get that. I know others who have experienced events that were far more traumatic. They have been diagnosed with life-long conditions or have lost loved ones. But my event was enough for me, and for that, I’m thankful. Despite countless appointments, MRIs, tests, and scans, doctors never did figure out what happened or if it would recur. Whether right or wrong, I’m convinced this event was the physical manifestation of being out of alignment with my true self. If you put enough stress on any system, it breaks. Removing that stress, I decided, was a matter of living authentically. I made my own recovery plan. I needed to pursue my interests and passions. Instead of working for money, I needed money to work for me. What followed was simple. I redirected my energy toward engineering life the way I wanted. Within a couple of months, I executed on it, handed in my resignation, and never looked back. In fact, the grass is so much greener I’ve vowed to never go back. I’ll do whatever it takes to avoid a standard job. 2x’d my six-figure corporate income within just one and a half years. 2x’d my net worth within two years. Worked ground level with numerous multi-million dollar startups, integral to their launch and growth. …all while working fewer hours, being in charge of my time, and most importantly, enjoying what I do. None of this would have happened this fast—or at all—on the standard path. And since publishing the 1st edition of Leave the Grind Behind almost exactly one year ago, the ride has only improved. That book went on to be a bestseller. I’ve made many wonderful connections as a result. It has allowed me to achieve a personal goal of positively impacting tens of thousands of people. My real estate portfolio is up over $800,000 (all of which happened in about three years). 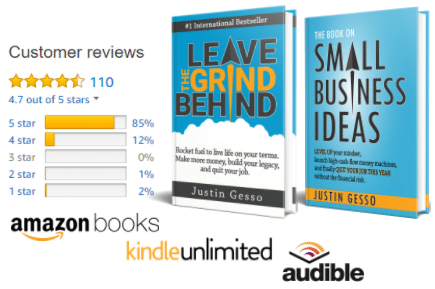 A couple of the businesses that were starting at the time I wrote Leave the Grind Behind have successfully grown, beating goals I set for them. Can’t complain about that! I continue to feel more successful, savvy, and happy. I’m currently working with a friend to acquire and reposition a 60-unit apartment building. 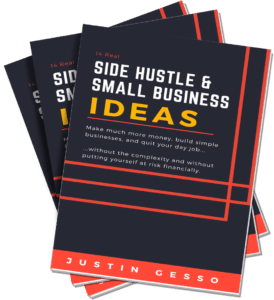 I’m fortunate to spend time on fulfilling projects I enjoy, such as writing this book. My network and small-business opportunities continue to expand. I’m able to use my time flexibly, leaving me more time to enjoy my family. But I still feel like I’m just scratching the surface. I’m at a new pivot point. It’s time for my next major disruption. I love the path I’m on yet know there’s so much more. If anything has become clear on this journey it’s that the people and relationships are what matter. So I’m expanding my goal of reaching people. I want to reach millions of people with messages they can relate to and be inspired by. I hope this blog is a big step in that direction. And specifically, I hope it gives you the tools and inspiration to set yourself free and realize the exact life you desire. I hope it gives you the tools and inspiration to set yourself free and realize the exact life you desire. As I write this, I wonder if my awakening was actually that rude. It seems like it may have been the best thing that could’ve happened to me. Maybe doing something big requires some degree of trauma. Maybe it takes a massive impact to knock you off the rails. Maybe not. What about you? If you’re reading this post, I suspect you’re ready to take control. Whatever your situation, whatever your cause, let’s make sure you’re not just along for the ride. Let’s put you in the driver’s seat. If you want to share your story with me, I’d love to hear it.